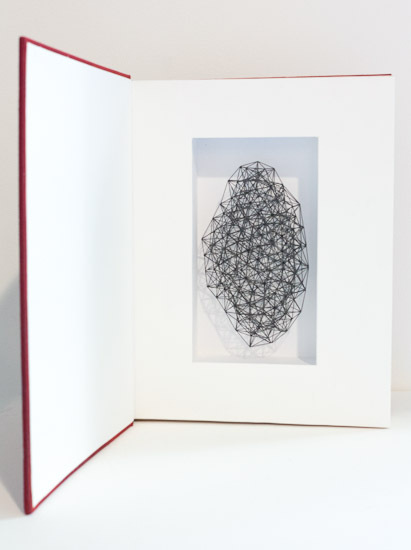 Drawing and sculpture are entwined in Peter Trevelyan's practice with both two and three-dimensional works 'drawn' in fine pencil lead, paper, plastic or other media. An investigation of the role of drawing is at the heart of his work. The tool of drawing becomes the material of sculpture. His signature material, tiny 0.5mm graphite, mechanical pencil leads are joined together to create "astonishing" sculptures that may also be seen as built drawings. Joined together in a diverse range of geometrically simple and complex structures, the works vary in scale from small to as large as six metres. With its mixture of fragile material and tensile strength, the work audaciously challenges forces of gravity to create a visceral response in the viewer. Trevelyan graduated with a Bachelor of Fine Arts from Ilam School of Fine Arts, University of Canterbury in 2000 and completed a PhD at Massey University's School of Fine Arts in 2014. He has built up an impressive exhibition history which has included several major temporary public art works and over 25 public gallery exhibitions. His work is in public and private collections in New Zealand, Australia and Hong Kong.